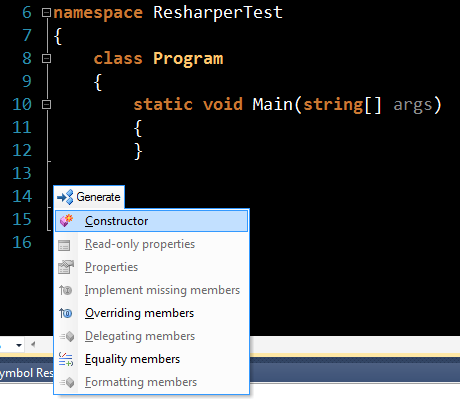 I'm using Resharper 5.1.3. When I put my cursor inside of a class and hit Alt-Insert I see the menu I expect, but Properties and Read Only Properties are greyed out. I can generate a constructor just fine. Any idea what my problem might be? idea what my problem might be? I created a brand new project, and put the cursor inside of the class Program where I would normally insert a property, then hit Alt-Insert. Attached is a screenshot of what I see, and the project that I reproduced it in. behavior do you expect from Generate | Properties in your example? Program where I would normally insert a property, then hit Alt-Insert. but it sounds like maybe GenerateCode is more about generating code where everything can be inferred as opposed to templating code where I have to fill in the blanks. Thank you for your quick response!